India is one of the few countries in the world where football does not reign supreme. That distinction goes to cricket, which, having been imported to India by the British in the late-19th and early-20th centuries, is the number one sport there by far. Nevertheless, with FC Barcelona in the midst of a global expansion that has set its sights on places like the United States, where a culture of sports is well-established but where football has ample room to grow, India has become a prime target as well. But while there are obvious signs that the sport of football is picking up plenty of steam in the South Asian giant, the fledgling Barça–India relationship is one of mutualism. The Legends, besides playing in the match, also helped inaugurate a youth football tournament that was put together by the Kolkata Police as a way to get children off the streets and into more organised activities. 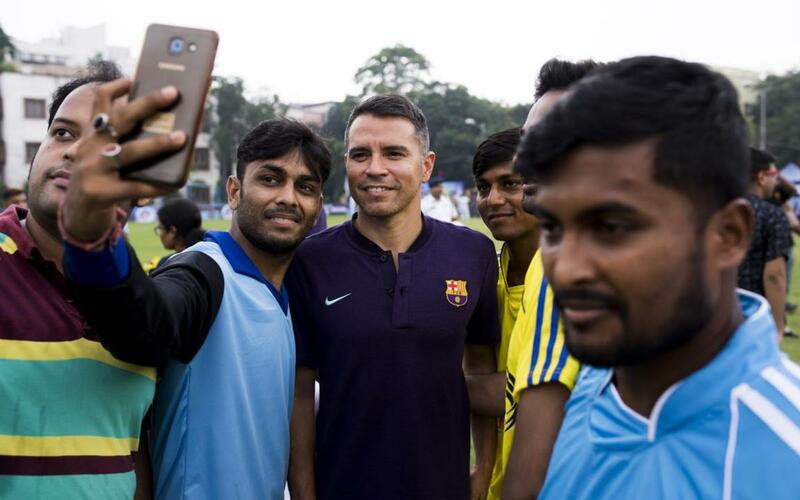 Events like these, which are such a positive force for huge cities like Kolkata, have drawn plenty of attention not only to the Barça brand as a whole, but also more specifically to the Barça Academy Delhi — to which Saviola paid a special visit — and the Barça Academy Mumbai, where hundreds of children learn how to play football the Barça way while adhering to the Barça values. Saviola — who has trained under myriad methodologies while playing for several different clubs in Argentina, Spain, France, Portugal, Greece, and Italy — has become a first-class ambassador for the sport of football and the Barça philosophy, which he touts as second to none.